With Marshfield and Xaverian having prevailed in Monday’s play-in games the field for the 29th annual MIAA Division 1A Tournament is set. 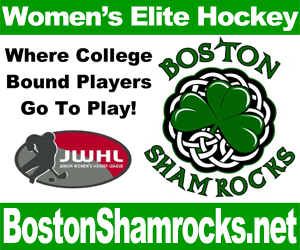 Quarterfinal games for the double-elimination event will be held Sunday at Tsongas Arena in Lowell with No. 1 BC High kicking off the action at noon against No. 8 Marshfield. 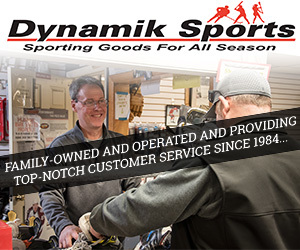 Losing teams drop into the Elimination Bracket for March 5 games at The Chelmsford Forum while Winners Bracket games will be at Tsongas on March 6. Does BC High have what it takes to repeat? If so, the Eagles would become the 25th Catholic Conference program to claim the championship. A sixth title would break a tie with Malden Catholic for second place behind Catholic Memorial. Since they are perennial contenders in this event, it begs the annual question: Is this the year of a Pope Francis breakthrough? The Cardinals were less than a minute away from winning this last year until it all went sideways in a 2-1 OT loss to BC High. You can bet that’s a memory they are playing to erase. Can the publics make a bit of history? No. 4 Arlington (2017) and No. 3 Hingham (2010) both have a shot to become the first two-time public school winner of this event. It is no surprise that they are among the most successful schools at retaining their home-grown talent. Boasting the division’s highest-scoring offense (94 goals) and a robust plus-68 differential, the Catholic Conference champion Eagles are well-armed to defend their championship. They closed the regular season in impressive fashion, claiming the Buddy Ferreira Classic championship without allowing a goal in three games. The offense features the high-flying Kramer brothers with senior Thomas (16-20-36) leading the way. Sophomore twins Joseph (15-15-30) and Peter (10-19-29) are equally productive. Junior Matt Keohane (9-6-15), senior CJ Martin (3-12-15), senior Matt Lakus (5-9-14) junior Aidan Carey (8-5-13) add to the mix at forward. 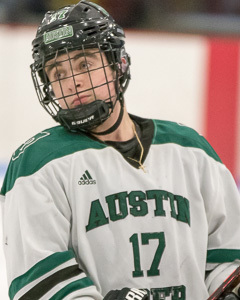 The Eagles showcase a quartet of standout two-way defensemen in freshman Declan Loughnane (6-10-16), senior PJ Donahue (3-9-12), sophomore John Logan (2-10-12) and junior Mike Dragon (4-6-10). Senior Chase Congdon (1.47 gaa, 4 SO) gets the bulk of the work in goal with Connor Flavin (0.80 gaa, 2 SO) superb in reserve. The Eagles are chasing the program’s sixth 1A and seventh title overall. Wins – Arlington, 7-0; Pope Francis, 5-4; Xaverian, 3-1, Xaverian, 6-2; Austin Prep, 2-0; Hingham, 3-0. One of two Independents in the field, the Cardinals put together arguably the state’s most difficult schedule. They stepped out for four December games before facing their first Massachusetts opponent and were tested eight times by high-end out-of-state competition. No team in this tournament will surprise them. 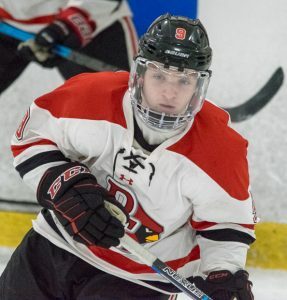 Once again the offense features the high-powered trio of seniors Makem Demers (16-22-38), Max Cocchi (18-14-32) and Jon Tavella (13-15-28), easily one of the state’s premier lines. 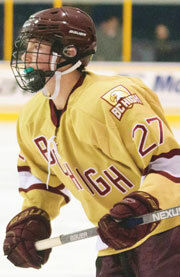 Sophomores Brandon Spaulding (5-7-12) and Evan Phaneuf (4-7-11) are emerging forwards. Senior Victor Larssen (1.94 gaa, 2 SO) and sophomore Ben Zaranek (1.48 gaa, SO) form a reliable tandem in goal. The defense features seniors Zac Reiser (8-7-15) and Spencer Stewart (3-9-12) and sophomore Matt Burke. The program won three State titles in two divisions in its previous incarnation as Springfield Cathedral. Perennial 1A qualifiers, the Harbormen are one of only three public schools to win this tournament, having done so in 2010. As an Independent they always play one of the State’s toughest schedules and are tourney-ready come post-season. Overlook them at your peril. Junior captain Will Kenney (11-24-35) drives the offense along with senior Jacob Clark (16-15-31) and sophomore Trevor O’Brien (9-16-25). Junior Tim Carroll (16 points), senior Ryan Reilly (11 points) and sophomore Paul Forbes (7-3-10) provide supplemental scoring. 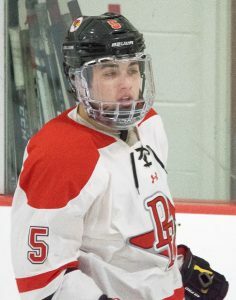 The Harbormen boast one of, if not the premier, two-way defensemen in the division in senior captain Jake Higgins (7-22-29). Senior Mike Carroll, senior Caleb Woodin. junior Danny Packard and sophomore Carter Rugg are key members of the blue line crew. Senior Aaron Richardson (1.66 gaa, .906 save pct., 3 SOs) mans the goal. Hingham has five State titles to its credit. The Middlesex League Liberty Division champion Spy Ponders became just the third public school to win the 1A tournament in 2017. A clutch of players remains from that club who would like nothing more than to make tournament and public school history. The Ponders hit the post-season on a 6-0-1 roll, including a championship in their Ed Burns Holiday Classic. 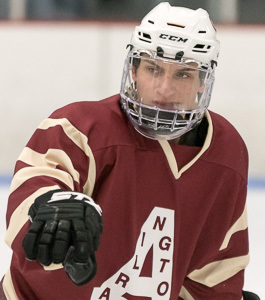 An offense that produced 72 goals and a plus-37 differential features a Top Six forward group of seniors Will Jennings, Dara Conneely and Joe Scheshareg and juniors Anthony Messuri, Drew Malatesta and Brendan Piggott. Senior Jack Simon leads a stout corps of defensemen that includes juniors Ryan Davies and Tyler Callahan. Junior Nathan Brennan has emerged in goal for the Spy Ponders, who are seeking the program’s eighth State title. 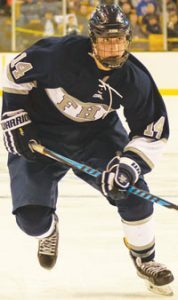 In a word, the Flyers put together a spectacular season to earn an automatic 1A bid and they are not to be overlooked. Two of their three losses came to the second and third-seeded teams, each by a single goal. They clearly have what it takes to compete with any team in this field. A number of key players remain from the 2017 club that advanced to the D1 State title game. Chief among them is flashy senior forward Mike Tersoni (18-14-32) the leader of a well-balanced attack along with junior Will Trischitta (12-13-25). Seniors PJ Conzo (5-11-16), Nate Nichols (9-5-14) and Brian Tosi (4-8-12), junior Robbie Lopez (10-8-18) and sophomore Hunter Balducci (8-7-15) add to the mix. Junior Jake Handy (1.36 gaa, .926 save pct.) has logged the bulk of the time in goal, backed by senior Dominic Schiappa. 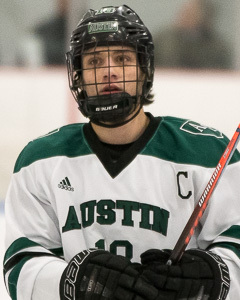 A young group of defensemen has been terrific, including junior Ryan Walton and sophomores Jared Shimelman (2-8-10), Dom Leone and Thomas Chase. The Flyers are seeking the program’s third State title. The Catholic Central Large champions were the division’s stingiest team, yielding a miserly 21 goals. That’s the good news. Conversely all four losses were to teams in this draw that accounted for more than half (11) of those goals. AP will have ratchet up the defense another notch as it chases the program’s third overall State crown. 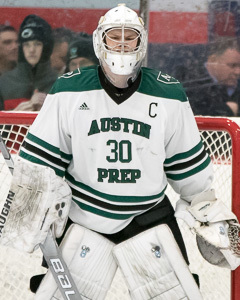 Senior goalie and captain Robbie Farrell ranks among the division’s very best and owns glittering numbers – 1.23 gaa, .943 save pct. and 7 SOs. 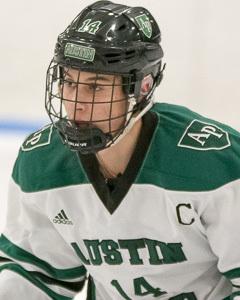 Senior captain Evan Rago (4-6-10) is the leader of that lockdown defense that includes senior Evan Foulds, junior Will Cohen, sophomore Colin McGrath, and eighth-grader Jack Farrell. 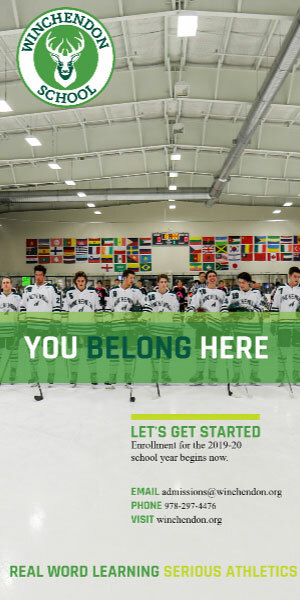 Offensive options are abundant and balanced with senior captain Max Pineo (13-9-22) and sophomore Joe Solimine (10-7-17) leading the forward group. Junior Chris Roy (10 goals), sophomore Doug Russo (13 points), senior Sully Marino (11 points) and sophomores Brady McGrath (10 points) and Joe Thibodeau (10 points) are steady contributors. The Hawks claimed second place in the Catholic Conference and advanced via their 4-2 play-in decision of Duxbury. They are chasing the program’s first-ever state title. They will lean heavily on senior goalie James Herring, who logged the bulk of the time and compiled a 2.20 gaa/.912 save pct./2 SO slash line. Senior AJ Scott is a proven option as well. Seniors Matt Joyce (10 points) and Doug Concannon and sophomores Shane Spinale, Andrew Barton and Trevor Connolly form the core on defense. 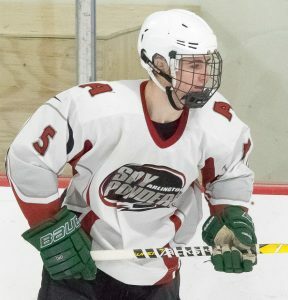 Coach Dave Spinale’s club showcases one of the division’s highest-scoring trio of forwards in senior Josh Barton (17-20-37) and juniors Matty Ryan (13-20-33) and Ryan Pomposelli (11-16-27), who account for about two-thirds of the offense. Senior John Joyce (6-6-12), junior Eric Wainwright (8-4-12), sophomore Robbie Barletta (15 points) and freshman Jack Silva (4-7-11) add to the mix. The Atlantic Coast Conference champion Rams outscored their league opponents by a silly 42-2 count on the way to allowing just 26 goals all season. The Rama earned their 1A slot with their 5-3 play-in win against St. Mary’s and are seeking the program’s third State title. Senior goalie Jack Gatie (1.34 gaa, .929 save pct., 5 SO) anchors the Rams’ all-in defensive approach designed to disrupt opponents at every opportunity. Senior Kevin Buckley (3-9-12), junior Jon Jordan (5-7-12) and junior Charlie Kolar (2-10-12) lead the defense. While no player has scored more than 12 goals for coach Dan Connolly’s club, 16 have scored at least one. Seniors Paul Rorke (12-10-22), Sean Kennedy (6-12-18) and James Kolar (7-4-11); juniors Tim Doyle (8-9-17), Kevin Moriarty (7-6-13) and Max Burum (7-6-13); and sophomore Jake Mastrangelo (7-8-15) provide plenty of options up front.